Beyond choosing the lesser of two evils, and voting for a radical alternative, there is a third major reason that a lot of people use their vote: to keep the bad guys out. If we don't use our vote on one of the mainstream parties, then we run the risk of giving ground to the fringes. No matter how bad the current crop in parliament are, we need to stop the real swivel-eyed lunatics getting anywhere. Previously this threat was embodied by the British National Party, which has now collapsed into a mere shell of the hateful joke it once was thanks to split after split after split after split. In their place, we have UKIP. 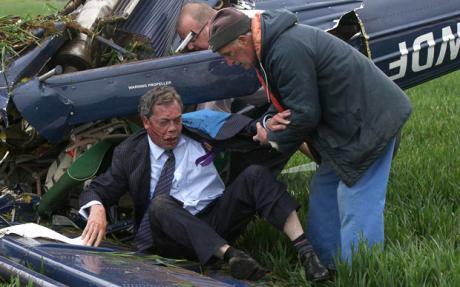 Nigel Farage, who tragically survived his helicopter crash, is everywhere. The media continually raise his profile while wondering confusedly how his profile has raised so dramatically. The SWP managed to squeeze yet another cheap front organisation (Stand Up To UKIP) out of him. The likes of Britain First see him and his party as a back door for their racist politics into mainstream discourse and perhaps even parliament. More importantly, while playing at being "common sense" and "anti-establishment," they peddle a racist and anti-worker agenda that's to the right of the Tories. They're definitely not people that we want taking power. Unfortunately, the answer to UKIP or any threat that preceeded them is so often presented as "vote to stop UKIP." Too often, a specific party (usually Labour) is presented as who we need to vote for to prevent catastrophe. The problem with this is that, ultimately, it represents a failure. In terms of anti-racism it's the equivalent of sticking a bucket underneath a drip but never bothering to patch up the leak. Attitudes in society cannot be voted away, and the physical threat of bigotry isn't something you can mitigate with an X in a box. Whilst society today is more tolerant than it was in the past, this is due fundamentally to social movements challenging bigotry. The same methods are necessary today as were needed in the past - propaganda on the one hand, challenging dominant narratives and prejudices, and physical defence on the other to repel violent threats such as organised fascist movements. But no matter how far we've come, the idea of racism as something on the fringes and the preserve of UKIP et al is erroneous. UKIP has attracted an awful lot of attention in the media much as the EDL and BNP did, with every gaffe they make plastered all over the papers. But this isn't because the media is anti-racist - rather it serves a distinct propaganda function. When now-ousted BNP leader Nick Griffin made his infamous appearence on BBC Question Time, for example, nearly all of the commentary focused on what a disaster it was for the far-right. How stupid and cartoonish these racists were, and how easily their arguments are torn apart! Except that after tearing Griffin a new one for his outlandish racism and ill-thought out ideas on "indigenous" Britons, Conservative community cohesion spokeswoman Sayeeda Warsi and Labour Justice Secretary Jack Straw (as they were then) argued over whether Labour's immigration policy was too soft. This was at a time when the Labour government had built up a state within a state of immigrant prisons, instituted exactly the scenario of hired thugs smashing in refugee doors and dragging them to forced deportation that the BNP longed for, and condemned untold numbers of "illegal" immigrants to life as enslaved non-persons on the black economy. Media focus on the racism and bigotry of parties on the fringes serves at once to sanitise mainstream racism by comparison and to drag mainstream politics rightward. Likewise, voting Labour or any other mainstream parties may or may not keep UKIP out of office, but it won't keep their ideas out. Ultimately, stamping out racism means building a movement which gives the working class a way to actively challenge their alienation and the present conditions so that the far-right can't offer scapegoats and false solutions that turn them against other sections of the class. Until we fill the vacuum, we still need to challenge racist ideas and physically repel racist organisations and movements. Getting out the vote against UKIP et al is at best a stop gap measure. At worst, it only feeds the illusion that racism is "out there," something external rather than right at the heart of British party politics.